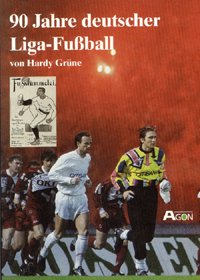 Actually, this is more of a series of essays chronicling different eras of German soccer up to the mid 1990s. While it contains interesting information, some of the chapters miss their mark. To be fair, this is considered somewhat of a text companion to some of the more statistical works by Grüne. Many of the articles are overly politicized. The author recognizes this trend, but feels it is necessary. At times, it therefore seems overly preachy. For example, There is plenty of criticism of how the soccer establishment fell in line with the Nazi reorganization. While certainly justified in pointing this out, there is no alternative proposed. I wonder what the soccer clubs were supposed to do? Perhaps tell the Nazis to "go stuff it"; I'm sure that would have worked. The fact that bureaucrats are weasels is a well known fact that is not limited to soccer federations. Overall, worth a read, but not necessarily a "keeper".